Steve Corsi was commissioned as Acting Director of the Department of Social Services on June 19, 2017, and was confirmed as Director by the Senate on January 18, 2018. 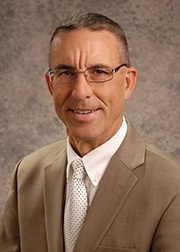 Corsi entered state government in March 2011, serving as the Director of the Wyoming Department of Family Services until May 2017. He previously held the positions of Chief Executive Officer of High Country Behavioral Health in Wyoming and Clinical Director and Principal of multiple behavioral health corporations. Corsi is currently an officer in the Army National Guard and was active duty enlisted Air Force for over nine years. Corsi holds a Bachelor of Arts in Psychology, a Master of Science in Counseling Psychology from California Baptist University, and received his doctorate in Clinical Psychology from Alliant International University, San Diego. Corsi’s strong belief in running strong, efficient, and data driven programs was a hallmark of his administration at the Wyoming Department of Family Services where his team not only improved outcomes for families and children but also reduced costs to taxpayers. In addition, Wyoming was one of the top states for child safety for three years running and the Child Support Program was ranked first in the nation for four years. Corsi‘s team reduced 1150 pages of rules and policies and decreased the department’s annual general revenue expenditures by nearly 25 percent. Dr. Corsi also helped establish the first felonious mental health court in the United States. Corsi is excited to be in Missouri – the land of Lewis and Clark – and have the opportunity to serve her people and explore the origins of the westward expansion.